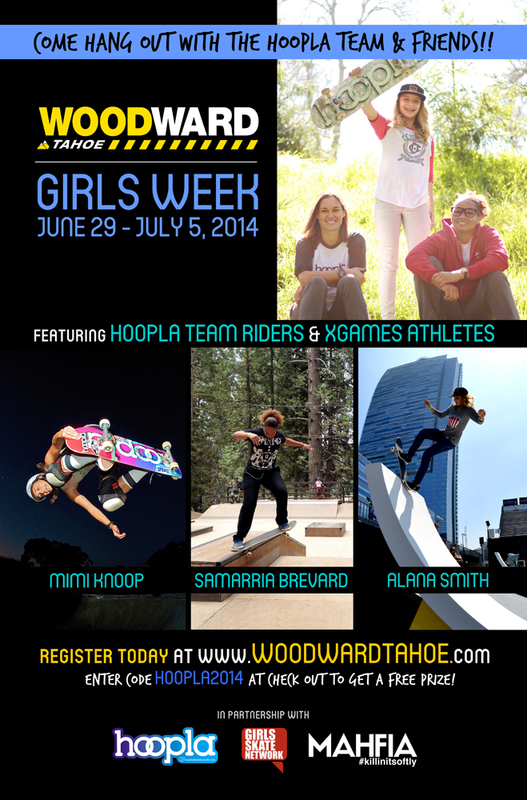 Hoopla Skateboards has partnered with Woodward Tahoe for their first ever “Girls Week” this summer. Join Hoopla riders, Mimi Knoop, Alana Smith, and Samarria Brevard for a week of skating and hanging out at beautiful lake tahoe! Girls Skate Network and Mahfia TV will also be there helping to document the fun. Sign up now and enter the promo code “hoopla2014” for $50 off and for the chance to win some hoopla goodies! For more info and to secure your spot, visit the woodward tahoe site here.